On Wednesday evening the Bristol Business School hosted Mark Stewart, GM and HR Director at Airbus for the first lecture in the Bristol Distinguished Address Series (BDAS) of the academic year. The aim of the talk was to tell us about how Airbus is seeking to address skills shortages in its industry. As a key local employer, Airbus have 4000 of their 55,000 employees based in Filton. Stewart pointed to sector research saying that 20% of companies are not confident in accessing the design and engineering skills they need, something that is important locally as Stewart highlighted that the Filton site houses the crème de la crème. Airbus have been highly proactive in addressing the skills shortages in their sector through a variety of measures of an impressively collaborative nature including jointly sponsoring 500 MSc bursaries across a variety of disciplines like aerospace engineering, composites and materials, and he felt the sector was reaping the benefits. Coupled with this is joint work with other organisations in the sector to identify where the skills shortages are. For example, Stewart highlighted high value design and propulsion. 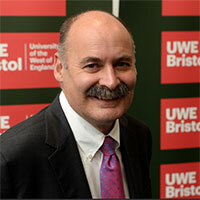 Having identified the areas of need, universities like UWE Bristol then join the effort to produce specific engineering education and qualifications that meet the employers’ needs. Overall Mark Stewart provided a strong case for collaboration when needing to take the long view in acquiring and retaining employees with key skills. Whether the collaboration is across the sector, with government or partnering with universities, he was persuasive in providing evidence that joining together works. And for such an important economic contributor to point to a scheme which had the genesis in our own research group and discuss it as one of their key vehicles in this quest, proves the value and importance of academic research and business/university collaboration. To listen to Mark Stewart’s address in full click here.